Moments after Apple announced on Monday that co-founder and chief executive Steven P. Jobs is taking a medical leave of absence, the Twitter community responded with a slew of get well soon messages. 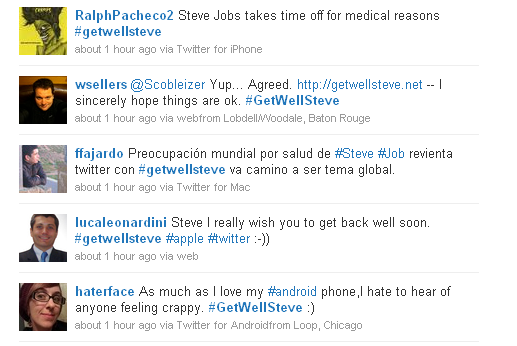 According to Web Pro News, Twitter users have been sending messages via the hashtag #getwellsteve. Jobs has asked Tim Cook to take over Apple’s day-to-day duties.